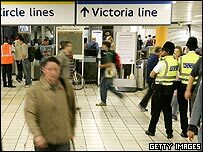 The humdrum tales of commuting became a global news story on Thursday as London weathered the impact of bomb attacks. And bloggers were the first to make their experiences heard. "They did their worst, and they managed to disrupt our transport network and get fatalities in the low double figures. That happens on a fairly regular basis anyway, you twits. What's your next trick - a fiendish weather control device which makes it rain on a bank holiday weekend?" Once we'd twigged that a power surge on the Tube doesn't tend to blow the top off a bus, the facts were grim, but few. The basic points were the locations of the bombs, and the numbers of casualties, and then of fatalities. There was no context, and no idea of the future. But there were other facts we wanted to know. What was it like down there? What's it like in London now? And how do we feel about this? All of a sudden, the blog turned out to the ideal news resource. At their most mundane, weblogs record the minutiae of the author's day; on Thursday, this trivia became the biggest story in the world. Every feature of blogging found a new use. Comments sections became "Are You Alive?" sections. PayPal accounts became donations to buy beer for the emergency services. And long before politicians had a chance to make a statement, Londoners' own reactions were being quoted as the voice of Britain around the world. It's impossible to cover the breadth and volume of first-class blogging over the last few days, but here's a taster of how online writers have cheered themselves up, shaken a fist, or simply shouted that they're alive. "A funny thing happened to me on the way to work this morning. My tube blew up." "Silence descended on the carriage apart from people choking and coughing, then someone near me quipped, 'Well, at least we got the Olympics!'" "To my eyes it seemed that the Major Incident planning was going smoothly, turning chaos into order. And what you need to remember is that this wasn't a major incident, but instead four major incidents, all happening at once." And as their lives continue, the survivors continue to blog, two themes being recovery and pesky media intrusion. Justin at Pfff gives a moving answer to the question "Why did I blog?" and R, now blogging here on the BBC site looks to the future: "I love London's diversity and tolerance and zest for life." "I'm at home about 200m from the Aldgate East explosion, the first I knew of it was an email from Brisbane. In Australia. Bloody internet." The more prominent Britblogs rose to the challenge, sticking together reports, links and travel advice in liveblogs which made sense of an insane day: Robin Grant, Nosemonkey and Tim Worstall offering far more links than this article can hold. "May I just remind you of one of those little rules that we have in our civilised society? We bury the dead and console the bereaved before we start making asinine political points." In its place, we saw suggestions, like The Sharpener's plans for a public demonstration of defiance, impromptu whip-rounds and impromptu t-shirts to raise money for the Red Cross and to mock the bombers. Early on, the US-based Daily Dish identified this prevailing spirit of stoicism, and wrote: "Right now, a million kettles are boiling." "That's Britain for you. Tea solves everything. You're a bit cold? Tea. Your boyfriend has just left you? Tea. You've just been told you've got cancer? Tea. Coordinated terrorist attack on the transport network bringing the city to a grinding halt? TEA DAMMIT!" "If you're all Londoners today, that's eight quid each for the congestion charge." "We know the pain, sadness and chaos that such inhumane acts may bring to a lot of innocent people and families because we are experiencing it on a daily basis from the same thugs, the Wahabi terrorists cockroaches." And so life goes on. Acts of violence can cause damage in their aftermath; they can frighten people, and they can turn them against each other. This time, there was a new tool available - blogs - and they've been used for communication, help and humour. So much for terror. If there's a blog you would like to suggest for inclusion, please let us know about it here.